Tanks, pods, cabins, sensory deprivation, isolation…there’s a bit of lingo associated with floating. Although the basic definition of floatation therapy is universal, what you choose to float IN may affect how much you enjoy your experience. Are you really tall? A little claustrophobic? A tad picky (like us)? 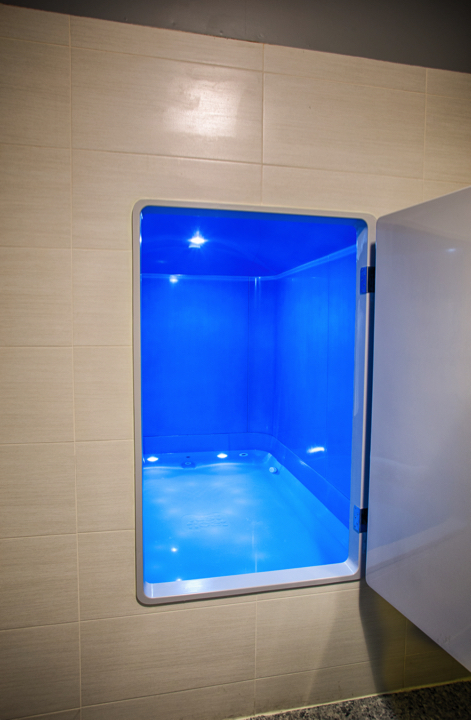 If so, it might be helpful to know what’s on the menu with our floatation tank comparison. Tanks, pods, cabins and open tubs are all different designs. Narrow, rectangular tanks have been around the longest, and Oasis and Samadhi (1) (both made in the U.S.) are the names most associated with this style. You enter this tank by bending through a hatch at one end and sitting in the water; these tanks are not large enough to stand in. Because these tanks are smaller than cabin-style tanks and more narrow than pods, some people may feel claustrophobic. Some floaters find it helpful to prop the hatch open with a rolled-up towel or even leave it open altogether to alleviate a confined feeling. However, many floaters feel completely comfortable in these tanks. Our amazing first floats were in Oasis tanks! The names most commonly associated with float pods are i-sopod (made in the U.K.) and TrueREST (made in the U.S.), but new tank manufacturers are popping up pretty regularly as floating continues to blossom all over the world (2). Pods tend to be more curvy and slightly wider, with a lift-up lid at one end of the tank. These allow you to step in, then sit down and close the lid. Once the lid is closed, it’s not possible to stand. These tanks are a bit roomier, and the soft, rounded shape is appealing to many. These modern designs also include features like built-in speakers and LED lighting to allow floaters to control the ambiance of their experience. Cabin-style tanks, like ours at Just Float, aim to give people more room to float. Cabins tend to be built into a wall and entered by stepping through a door. They are large enough for most people to stand in and are wider than most tanks or pods. Some, including ours, have light and audio options for customized experiences. As floating evolves, tank designs are changing to meet the desires of the float community, and roomier, technology-rich cabins are an example of this evolution. Open float rooms are more like a standard bathtub, just larger. They are not enclosed, so there is no door or hatch to close. Because of that openness, light and sound are controlled by the architecture of the room as a whole, which may lead to variations. This design is most accessible to people with disabilities or severe claustrophobia, allowing them to experience the freedom of floating without the pitfalls of an enclosed space. At Just Float, one of our rooms is open so that we may best serve everyone in our community. No matter what you float in, the benefits of floating remain the same: Intense relaxation, stress relief, reduction of pain and inflammation, improved sleep. However, as with anything in life, your comfort influences your experience, so you want to find a float center that best aligns with your needs. The amount of light and sound also affect the quality of your experience and the depth of relaxation you may achieve, so that should be a consideration as well. In the end, we want you to achieve your perfect float, and we hope this information empowers you to find it! I have never heard of float tanks until my aunt told me about them last night. It is interesting that there are so many different kinds- like tanks, pods, cabins, sensory deprivation, isolation… is there an advantage to choosing one over the other? They all seem like good options. Maybe it is just a personal preference.